Why drain the swamp when you can invest in it? Strategas, an advisor to institutional investors, offers a fund of 50 stocks selected on how much they spend on lobbying. Their strategy was featured in Barron’s and explained how they are getting superior return because of it. The key line in the paragraph about the portfolio and why those companies engage in aggressive lobbying was “The return on their ‘lobby dollar’ is largely gauged by success in preventing harmful regulations and encouraging favorable ones with a specific earnings impact.” Businesses and others have been lobbying for millennia, but now it's a planned and expected course of corporate strategy and a key element of risk management. How dignified it all sounds now, with stockholders expecting and sometimes demanding companies be aggressive in this area. The fund started in 2009 and the concept was verified in a paper published at Boston University Law School in 2014. They found that lobbying had significant return on investment for many companies that outpaced other executive actions. That is, it had a higher ROI and other benefits than new investments that result in actually making new stuff or creating new services for customers. Believe it or not, the world lacks—and has always lacked—a red pigment that has no issues with safety, stability, chromaticity, and/or opacity. Bloomberg takes a deep dive into the quest for new pigments—including the elusive red. Ironically, it starts with the creation of a new blue. The U.S. Postal Service’s first scratch-and-sniff stamps will add the sweet scent of summer to letters of love, friendship, party invitations and other mailings when the Postal Service introduces the Frozen Treats Forever stamps June 20 in Austin, TX. Hmm… This is cute, but it’s not clear that it would do much to drive up mail volume. (“If only we could send direct mail that smelled like popsicles,” said no CMO ever.) And kids’ party invites are the purview of Facebook these days. Still, if the idea of scratch-and-sniff stamps catches on, we have some scent suggestions for correspondence intended for the IRS, the cable company, or members of Congress. A group of journalists protesting outside the offices of a New York City hedge fund recently shined a light on a little-known fact about the state of the local American newspaper: Behind the scenes, financial firms often hold all the cards. [T]he evolving ownership picture has sparked fresh questions over whether investment firms can really help save local newspapers by making them profitable again -- or if they’ll starve them to the point that they collapse instead. In the aggregate, it’s true that employment has flatlined at brick-and-mortar retailers, which we define as NAICS codes 44 and 45 minus nonstore retailers. However, despite the weak recent growth, brick-and-mortar retail employment is still close to a historical high at 15.3 million, falling only 22,000 jobs below the peak reached in 2017. The historically high number of retail jobs overall does mask one negative trend: The growth of retail has not kept up with the rest of the economy. At the peak in the mid-1980s, retail made up 11.8% of overall employment. By 2017, it had fallen to 10.4%. So is this the much trumpeted death of retail? The author of this article places changes in retail in context by looking at the historical size of retail’s share of employment compared to manufacturing and healthcare. Over the past 50 years, retail’s share of overall employment has been pretty flat (moving in a narrow band between 10% and 12%), while manufacturing’s share of overall employment plummeted from 25% in 1970 to less than 9% today. Meanwhile, healthcare employment has risen from 5% in 1970 to 13% today. Not that retail is without problems (ecommerce is continuing to rise as a force to be reckoned with), but a lot of the conspicuous issues—vacant malls and shuttered storefronts—tend to reflect poor local economic conditions rather than overarching national trends. Blockchain can enable a brand to gain a big data insight into their customer demographic by facilitating and encouraging consumers to engage with their digital location-based advertisements (e.g. taking a picture and sharing it on their social profiles) in return for a customer reward - a process known as tokenisation. Leveraging location-based data can make a big impact for digital out of home advertising. Fundamentally, allowing brands to tailor their campaigns to a specific audience, at a specific time and with a specific purpose really makes a difference. Essentially, Blockchain is a decentralized record-keeping technology which facilitates secure and transparent peer to peer financial transactions without the need for centralized third-party administrators. These peer to peer exchanges are monetized and executed by an encrypted digital currency known as a crypto-currency. Although, if you watched Frank’s video today, you may be asking “Isn’t Blockchain closing their last location?” No, actually, that’s something completely different. We continue. [I]magine digital display which promotes users to interact with it by taking a picture and promoting the advert on their social media handles in return for a fixed amount of digital (crypto) store credit. In return this would allow a brand to create micro-targeted adverts as they would acquire specific and invaluable data about their consumer demographic. Do you have a Yeelight (a WiFi-enabled LED that you can control via an app, for some reason) or some other Internet-enabled lightbulb? 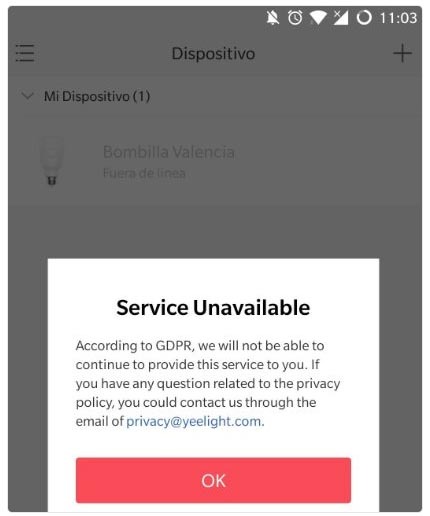 Via the internetofsh•t, the EU’s new GDPR (General Data Protection Regulation), which goes into effect today (May 25), has literally turned the lights out in Europe. Let’s hope the candles still work. In a somewhat related story, Instapaper is blocking European users until they figure out the new privacy rules. Hey, they only had two years. The high points? Strong backlist and downloadable audiobook sales. Low points? Ebooks and frontlist titles. Still, Stephen King just released a new novel, so that is surely good news for book sales. Do you want to celebrate with other like-minded nerds? Do you want to carry a towel around with you without having shame and scorn heaped upon you (or at least no more than usual)? Don’t panic! Click this link to find a celebration near you—and there are far more than you would expect. Retail employment also includes employment by retailers in their e-commerce initiatives, so the data don't show... much. So retail employment won't show the change in retail sales by channel. Subtracting nonstore retailers from the data as they say does not mean, for example, they are subtracting bestbuy.com employees from total retail employment. They still work for BestBuy. If I buy online from BestBuy and specify store pickup, the store employees are doing ecommerce work. For so many businesses it's a distinction without a difference. Retail will certainly be interesting especially as we watch the evolution of data / AI / and Generation Z.
Gen Z is much different than previous generations and will drive some interesting and confounding dynamics in our society. We all better pay attention... especially retail. What is old is new again? Maybe. Human to human interaction is powerful.